SO, YOU WANT TO MOVE TO FRANCE? My wife, Dorianne, and I decided to move to France about 9 months ago. We have been “on the road” since early 2015, when we sold our home in southern California. Since then, we have spent about half of our time in Europe and the other half in North and Central America. We have visited 23 countries and 16 states. I have blogged about some of our wine-related adventures. After thinking that we would probably settle in Spain, we chose France for two main reasons: first, we feel more at home in France, second, we like the hours that the French keep – not quite so late as in Spain. Both countries have great food and wine, and both have a “work to live, not live to work” lifestyle, so it was a close call for us, especially since Dorianne is conversational in Spanish and neither of us are in French. But France called us, no matter where else we traveled. We have been to France about 8 times since 2005, staying from a few days to several months, in places such as Paris, Avignon, Nice, Bordeaux, Lourdes, Aix-en-Provence, Burgundy, the Loire Valley, and Lyon. It’s a city, but smaller, less expensive, and less congested than Paris. It has a well-preserved historic section (Vieux Lyon, where we are currently staying), and beautiful architecture throughout the city. It has a great culinary tradition. There are four wine regions nearby (Burgundy, Beaujolais, Jura, and Côte du Rhône). An international airport and access to high-speed rail (Paris in 2 hrs.). A good chamber music community (Dorianne plays the violin). So, we began our research – after a brief visit in November, we began to do online research, looking at expat sites and chat rooms, travel blogs, French sites (including government sites on how to get visas, etc. ), and real estate sites. We decided to rent for a year or so to get a feel for in which area of the city we wanted to settle. What we discovered is that it is very difficult to get a work visa for France unless you are hired by a French company or working for a foreign company and will have a temporary assignment in France. The law says that to qualify for a job, there must be no French citizen who can fill that job, and then, no EU citizen who can fill it. Unless you meet those criteria or are going to invest and start a business and hire ten French citizens, you can forget a work visa. There are no investment visas in France, such as the Golden Visa for real estate purchases in Portugal, Spain, Greece, or Malta. We applied for a long-stay visitor visa (there are time constraints) (LINK) (LINK). Essentially, we had to show that we could afford to live in France for a year, had health insurance that covered us there, and were not wanted by the law. We submitted a stack of papers and had a short interview at the French Consulate in Los Angeles (you must apply in person at the embassy or consulate nearest to your US residence). Once approved, you get a visa in your passport, which they hold for a few weeks, so plan accordingly. You must enter France within 3 months of receiving the visa. We got our Visa in May and had it dated July 12, 2017 to July 12, 2018. You must enter France within seven days of the first date. The visa is good for the entire EU. We arrived in Lyon on July 13th, my birthday, and celebrated with a dinner at the Institut Paul Bocuse (LINK) – the restaurant of the famed culinary school operated by France’s greatest chef. It is run by students, and you get a Michelin-quality meal for a great price. They have a small but nicely selected wine list as well – and the wine prices are about the same as regular retail. I blogged about an earlier visit (LINK). We initially stayed at a friend’s apartment, but moved to an AirBnb for, we thought, a month or two, while we looked for a long-term rental apartment. That’s when we found out how difficult it is to rent an apartment in France if you are not a citizen or permanent resident (it’s also difficult if you are a citizen). It is illegal to rent to someone who has anything less than a work visa. And short-term rentals are limited to 3 months. We found that there are landlords who are willing to overlook the requirements, but they demand multiple French co-signers for your lease. It is also illegal to pay rent in advance (say pay 6 months or a year). The French laws are very much in favor of tenants, so the landlords take every advantage they can. We are still in an AirBnB. We are still open to a long-term rental, but we will be away for December and January at least, so we will wait until we return to look further. Actually, it is easier to buy here than to rent – the limitations on visas, etc. do not apply to real estate purchases. So, we may end up buying sooner than we expected. Prices in the Lyon area are cheaper than Paris, but there are not many bargains in the categories that we are looking for. Another important tip: if you want to do things like get a French cell phone or a transit card (TCL Carte in Lyon), you must have a French bank account. French banks do not operate like US banks in at least one sense – they don’t seem to particularly want new customers. We entered a branch bank to ask to open a checking account and were told that they next appointment to do so was two weeks away. At a different (downtown) branch, we got accounts right away, but we must do everything via that branch. You can do some things online and at ATM machines, but the system is very parochial. Once we had the account, and got some funds into it (another issue), we got cell phones and transit cards. You also need a French bank account to rent an apartment long-term, by the way. Once you have a French bank credit card (which work sort of like a combination of credit and debit cards in the US – you need to have funds in your account and can only get credit for up to 500€), you will find it easier to use than US cards in restaurants and shops. As for our first two months in Lyon – life is grand! We are eating very healthy, fresh food from the thrice per week farmers’ markets (marchés) in our Croix-Rousse (4th Arrondisement) neighborhood. Also, there are plenty of bakeries (boulangeries), butchers (boucheries), prepared food shops (epicères & traiteurs), and fresh fruit & vegetable shops as well. Oh, and every neighborhood has several wine shops (caves). There are also plenty of restaurants, brasseries, bouchons (Lyonnaise version of a bistro), comptoirs (counters), and coffee shops. And wine bars, too. The food is amazing in just about every place you eat (we avoid the chain restaurants other than some of the local chains which have two or three locations in Lyon). During August, just about everything that is locally owned and not a national or international chain closes for vacation for anywhere from two to five weeks. So, we drank a lot of supermarket wines during the month, which in France, is not a bad thing. There are very cheap to lower-mid-range (1.8€ to 18€ per bottle) wines from all over France, including Burgundy and Bordeaux in every supermarket. The wines are mostly from larger producers, of course, and you don’t see the premier cru labels there, however, the overall quality is very good. We were drinking wines from Tavel, Gigondas, Châteauneuf du Pape, Moulin a Vent, Burgundy, and others from the supermarket (supermarché) shelves. I was also introduced to boxed wine at a local party, and was pleasantly surprised at the quality of the Luberon Valley Syrah sold in a 5-liter box for 25€. The lifestyle here is to walk. I probably average 2 – 3 miles per day at least. We are mostly preparing our own meals, and eating lots of fresh fruits and vegetables. And there is wine and bread every day, too. I think that when you shop daily and eat fresh foods (even from the supermarket – avoid those center aisles with the processed foods), and those foods are grown on smaller farms (very little industrial farming in France), your body reacts differently to the foods you eat. I’ll be posting more wine-centric posts as time goes on. We are itching to explore the wine regions in the area in person and to delve more deeply into the Lyon wine scene. So, stay tuned. I would be very interested in your comments about being an expat or about your experiences with visiting France and other wine capitals in the comments section below. 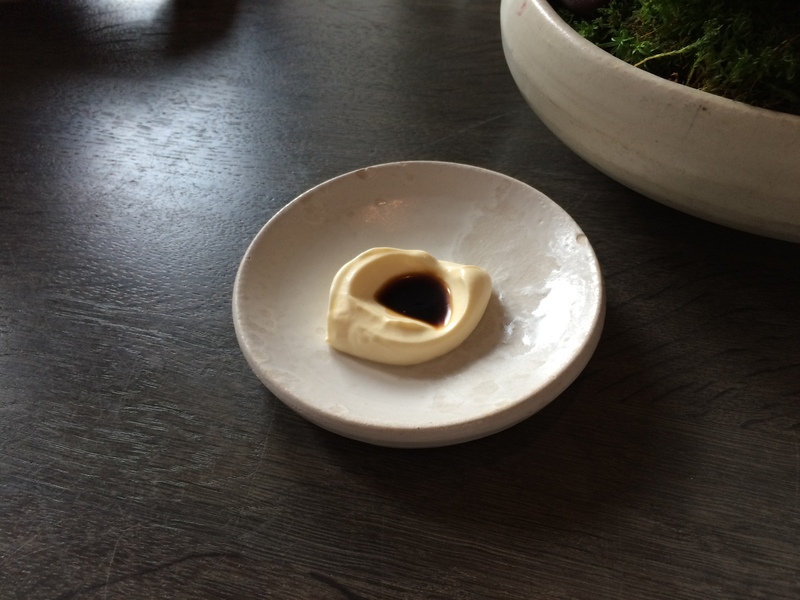 Noma, the Copenhagen restaurant that has been voted “The Best Restaurant in the World” (LINK) over and over, was the site of a recent visit by Dorianne, two friends, and me recently. Here are the links to the first two installments of the series: (LINK TO PART 1) (LINK TO PART 2). 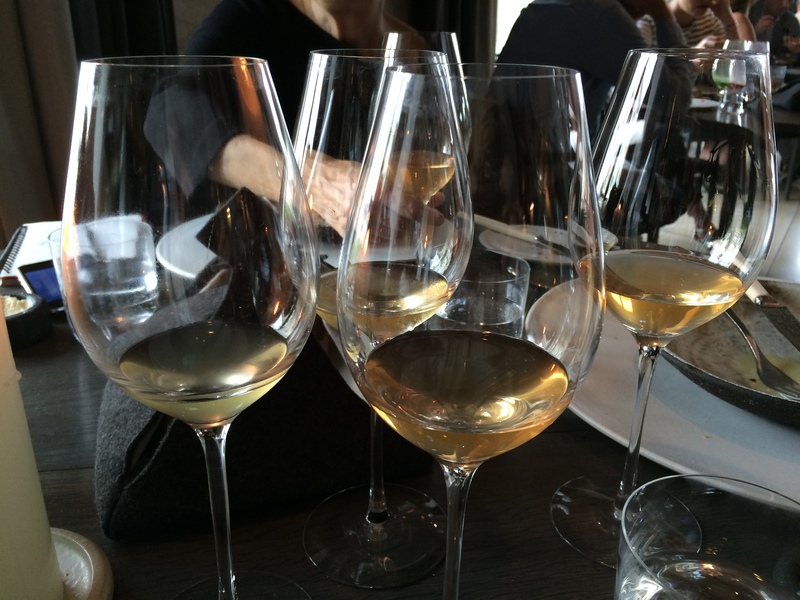 This post covers the second half of our 18 (actually 20) course meal and wine pairing. 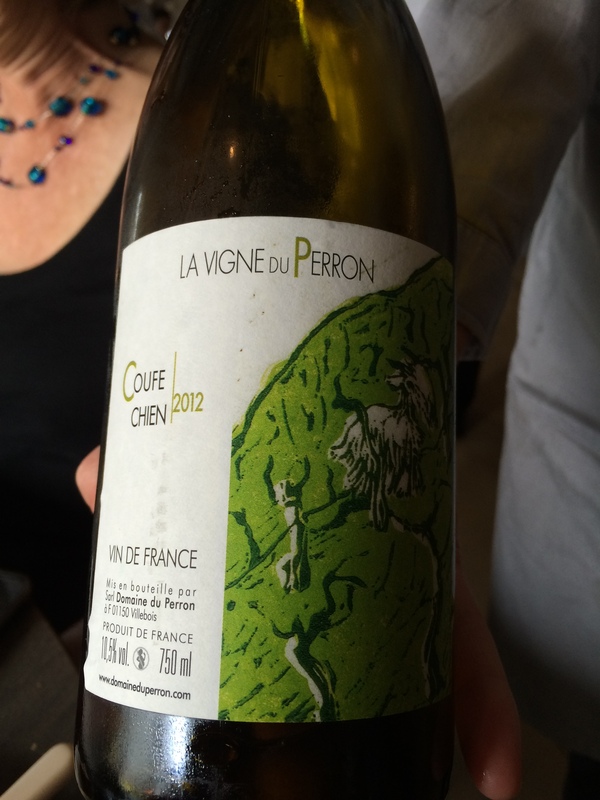 Our wine for this and the next course is a 2012 Coufe Chien, Domaine du Perron, Bugey – Savoie, Chardonnay (LINK to the 2011) from the Rhone Valley. Young and high in acid with an aromatic nose and hints of citrus, it was a perfect accompaniment to the Mahogany Clam. 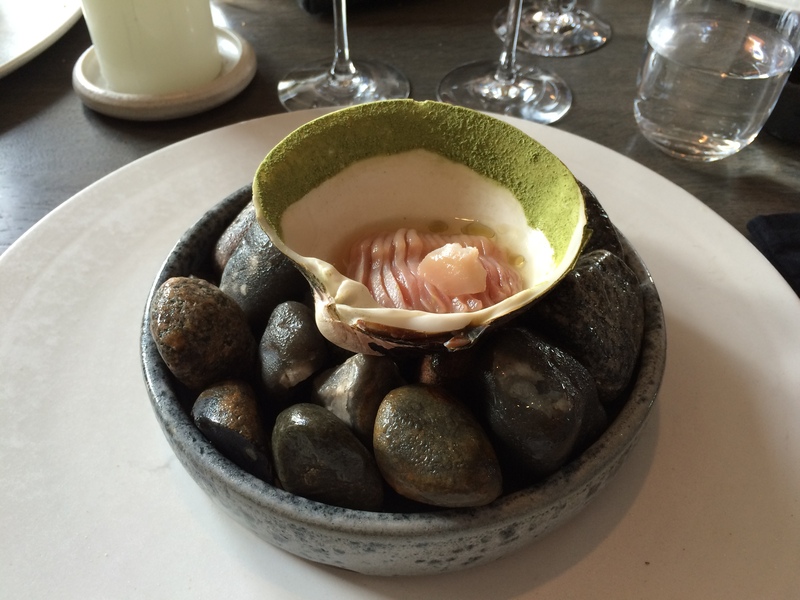 The single clam was mounted on a bowl of wet stones (which we were advised not to eat). 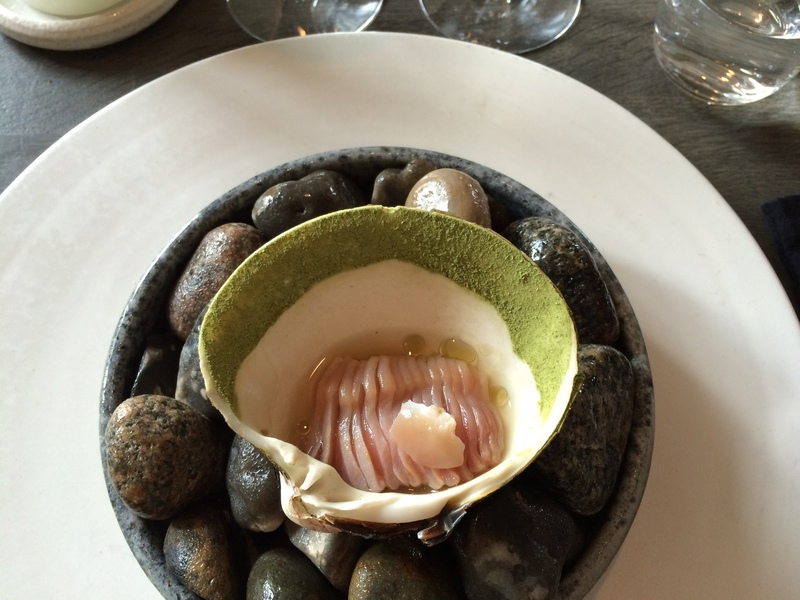 The uncooked clam meat was sitting in a marinade with a dusting of samfire (LINK) around the top of the shell. The dish was to eaten with a wooden fork. It was delicious – I could have eaten the rest of the dozen, but alas, it was not to be. 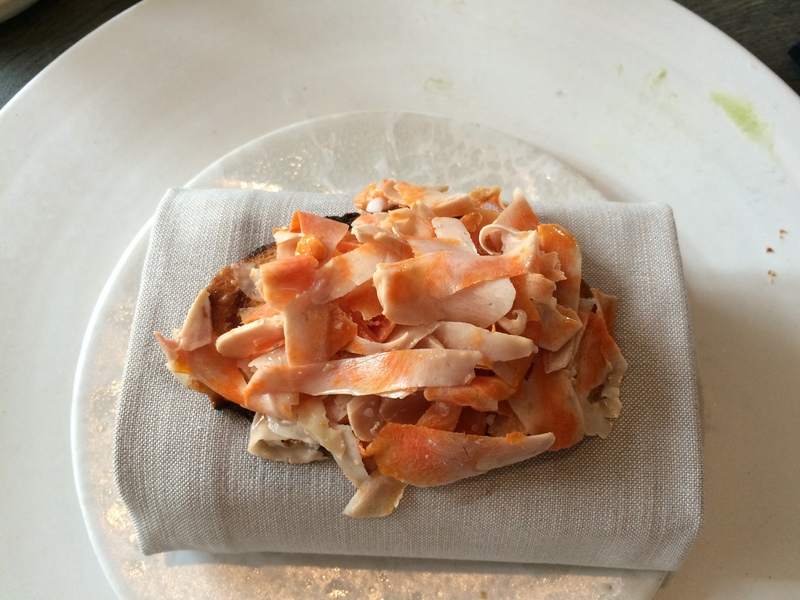 This course, Monkfish liver, cooked then chilled and served very cold on toast, sitting atop a folded napkin. 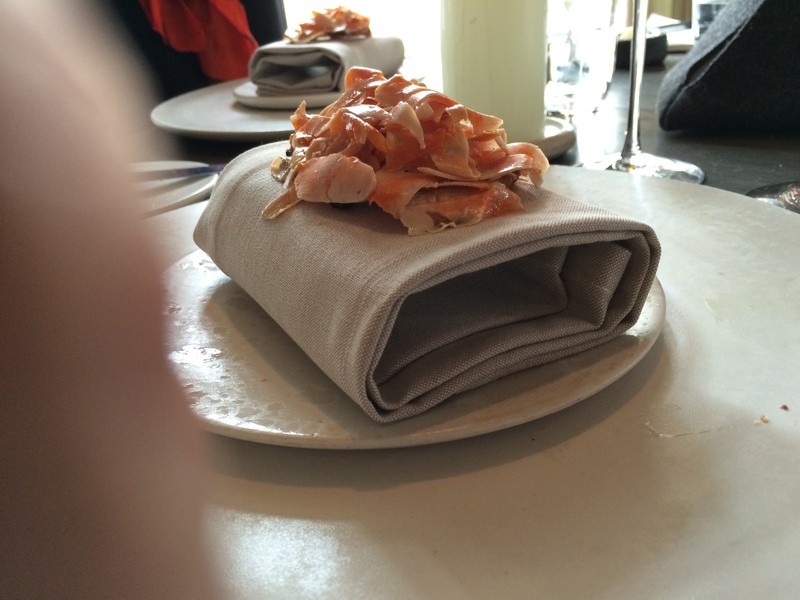 This was a particularly succulent dish, with a great texture and flavor. The Coufe Chien was a beautiful match for this dish. Eaten with fingers. White Asparagus, Goosefoot, and Barley. 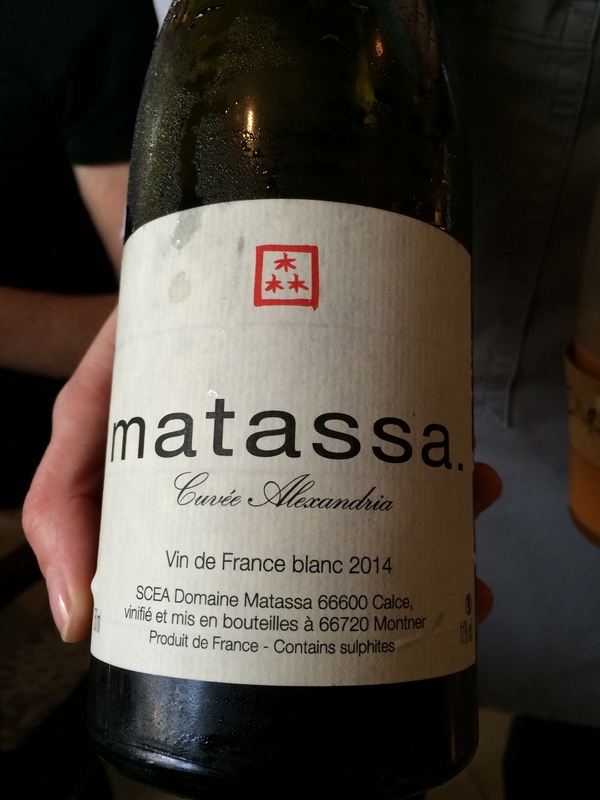 Our next wine, a 2014 Cuvée Alexandria, Domaine Matassa, Calce – Cote Catalan (LINK – click on Cuvée Alexandria), is described as a “raw wine,” made from a grape called Muscat d’Alexandria. You won’t find much about this wine, from the Catalan hills in extreme southwest France, online, and I doubt that you will be finding this wine in your local wine shop. The wine is unfiltered, very young and is very raw. I would describe it as bitter and a bit sour. Not for sipping. It reminded me of the must right after fermentation, while the wine is still in the fermentation vessel. 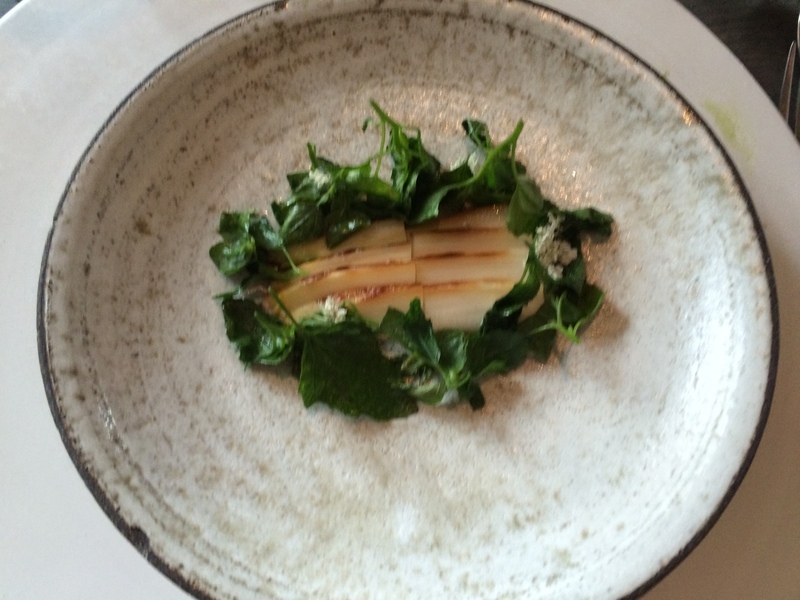 It was served with only one dish, a white asparagus, goosefoot (LINK), and barley plate, this one eaten with utensils. 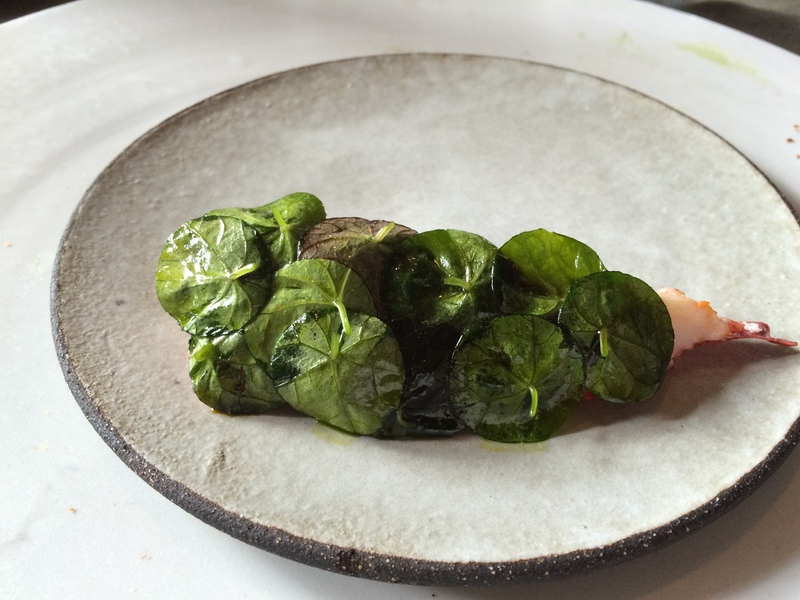 The asparagus was amazing – tender and delicious, the goosefoot and barley added notes of green sour and some texture. And, I was surprised to see that there was some justification for the wine pairing. The Cuvée Alexandria was a decent match, adding to the sour notes of the dish (you would have to like sour), and extending the flavors through a long finish. Intriguing. 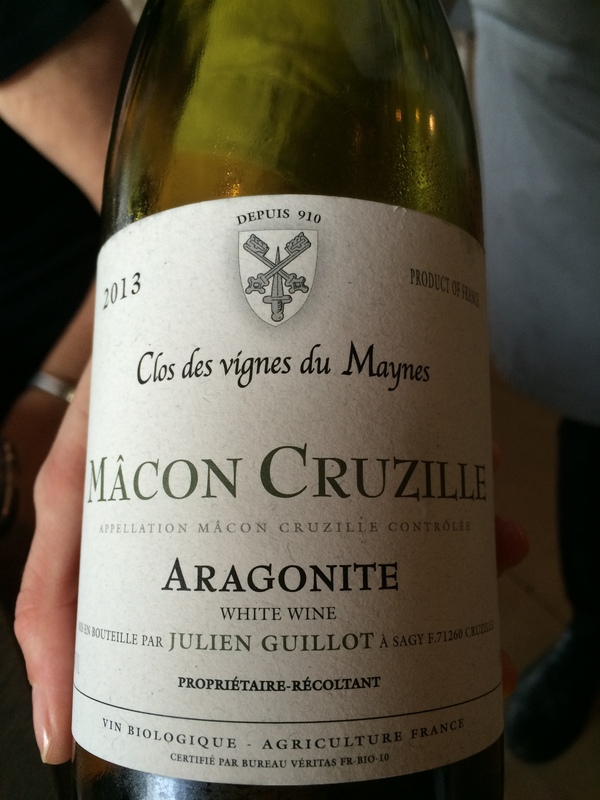 The new wine, a 2013 “Aragonite” Julien Guillot, Cruzille – Macon (LINK), a Burgundian Chardonnay, was a return to wine-normalcy for me. Fragrant, well-structured, and clean, the wine drank very well. 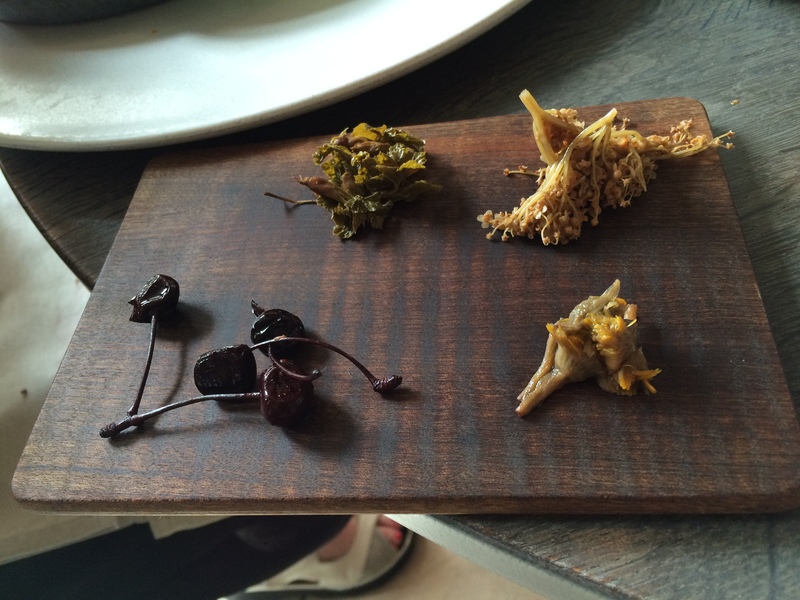 The first of two pairings with this wine was called vegetable flower. 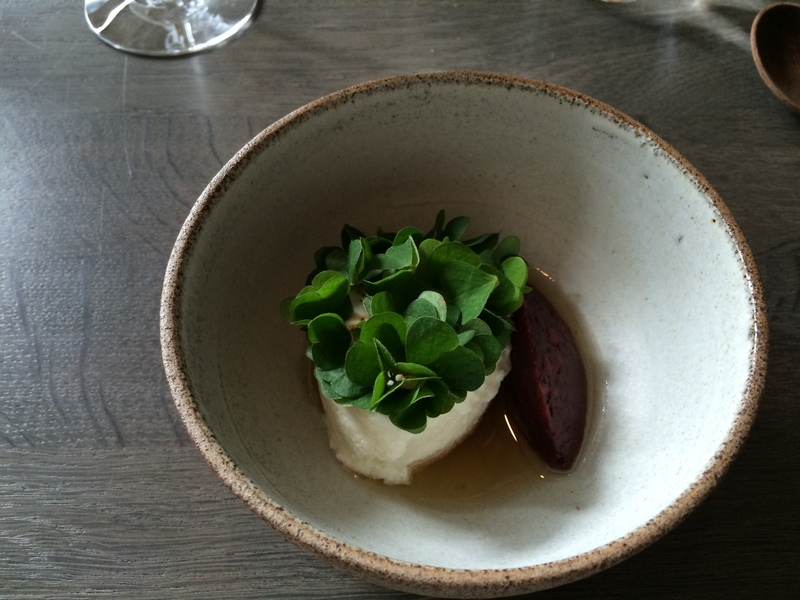 As you can see, it was nasturtium flowers in a vegetable broth. Delicious and delicate, the wine did not overpower this dish. Lobster and nasturtium was next. 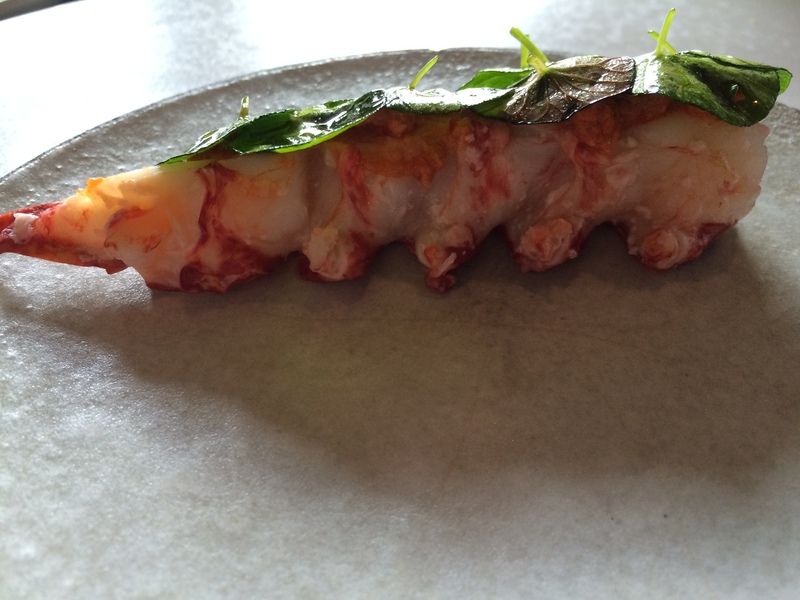 A North Sea lobster tail served with nasturtium leaves attached. Paired with the Julien Guillot Chardonnay, it was one of the highlights of the meal. 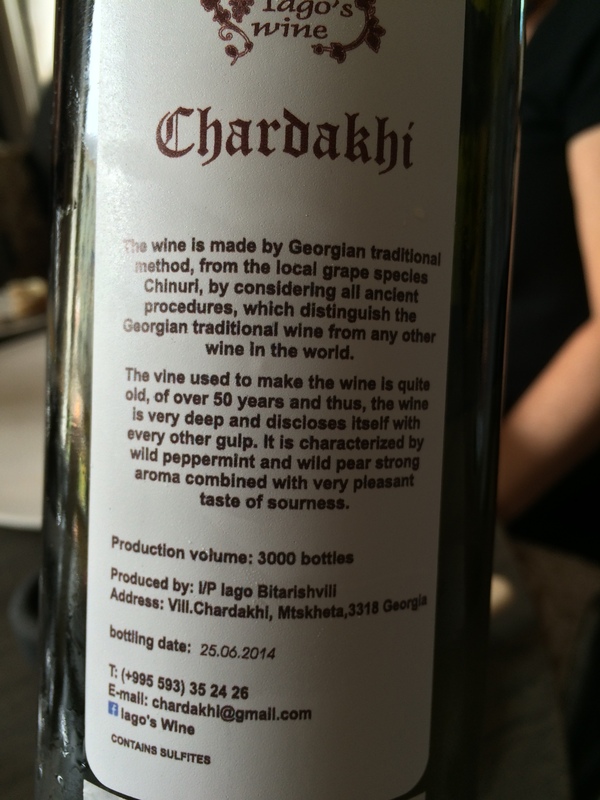 2013 Chinuri, Iago’s Wine, Chardakhi – Georgia. 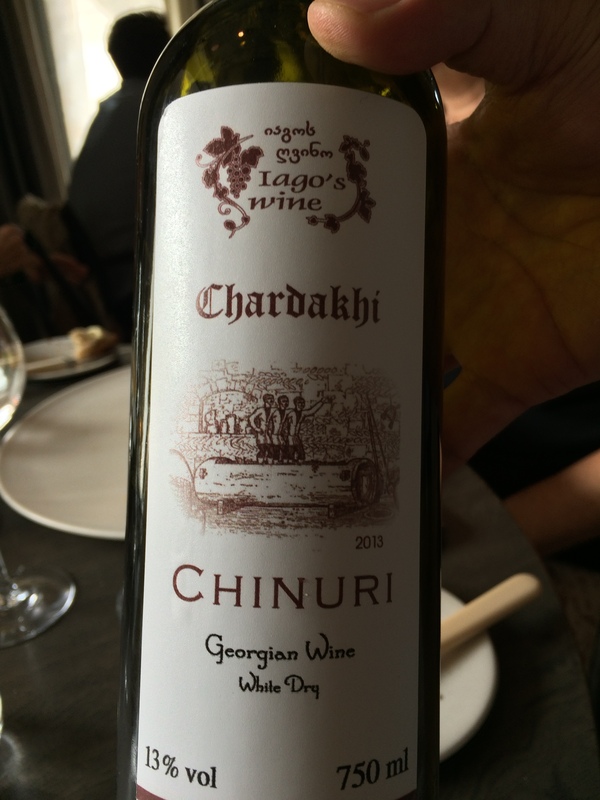 2013 Chinuri, Iago’s Wine, Chardakhi – Georgia. Back Label in English! The next wine, a 2013 Chinuri, Iago’s Wine, Chardakhi – Georgia (LINK), was most unusual. Unfiltered, young, sour. Even more so than the Cuvée Alexandria mentioned earlier. This wine was almost unpleasant – there was wine in the mix somewhere, it was just hard to find. 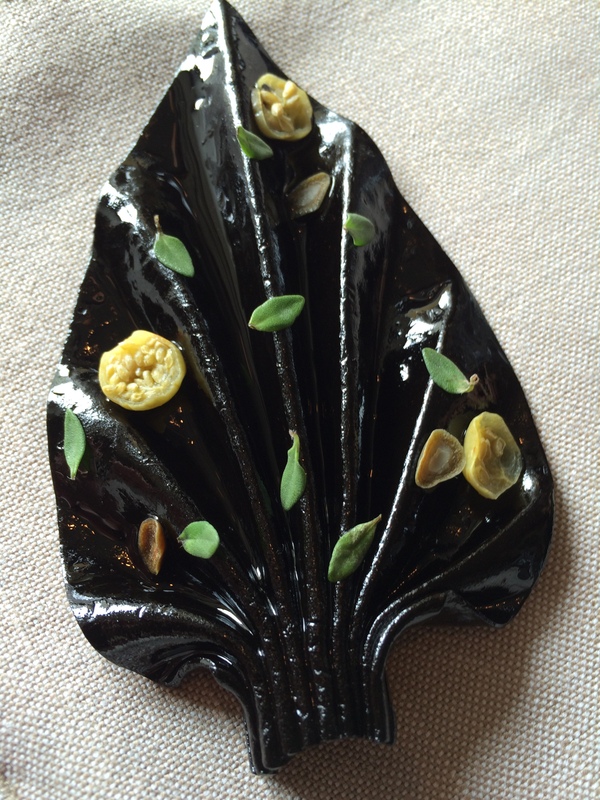 The first pairing was a dried fruit “leather” shaped into a leaf with a number of other items on it, including some garlic and grasshopper flour. 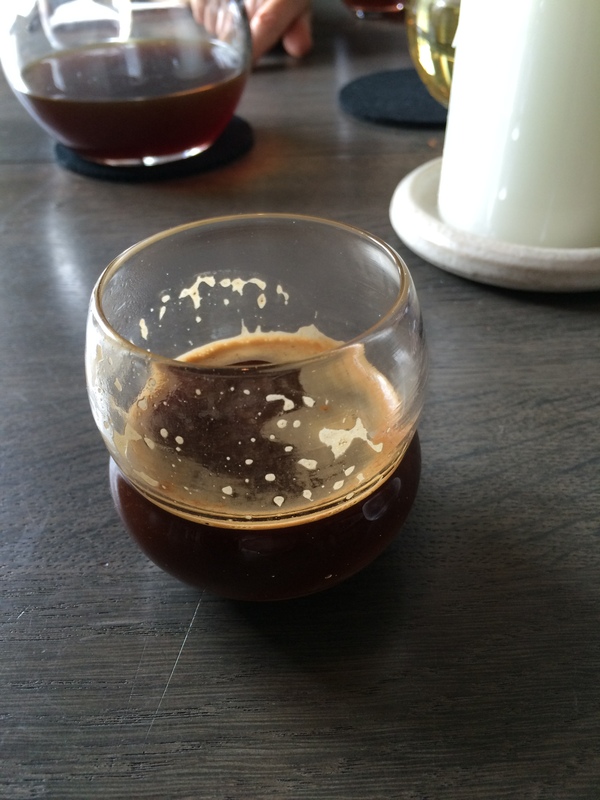 It had the consistency but not the flavor of licorice and was very good. 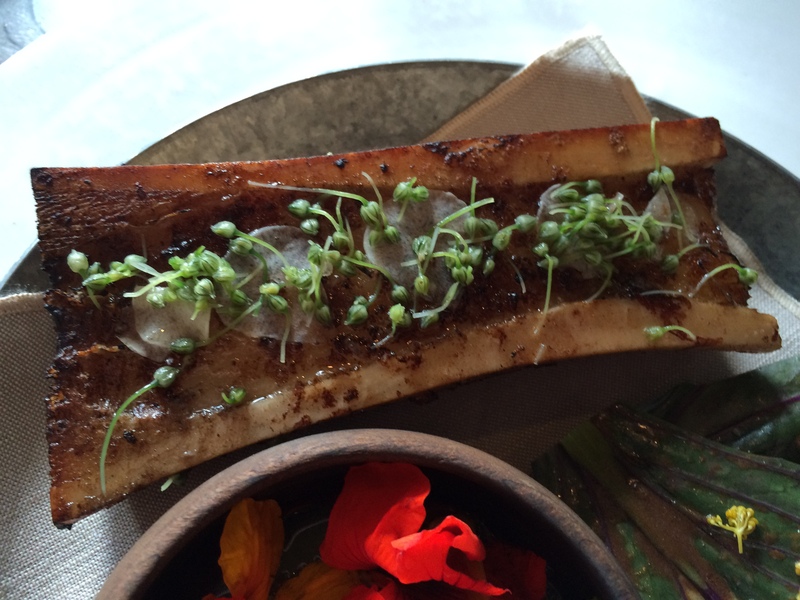 Bone Marrow with Flower Soup and Nasturtium Leaves. 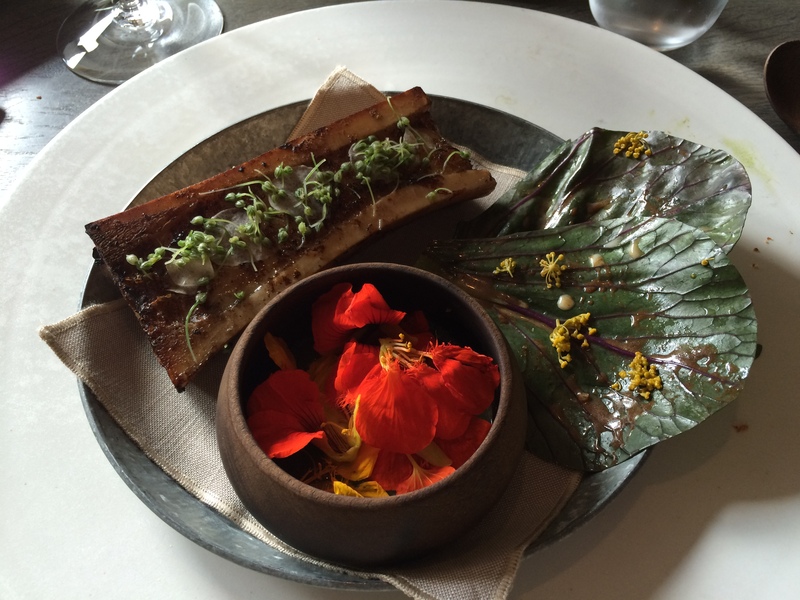 Then, a dish not on our printed menu – beef bone marrow with a “soup” of flowers, and nasturtium leaves. This dish was the only one served that might have called for a red wine, but the Chardonnay did it’s job of pairing pretty well. At this point, we were visited by the Sommelier, Yukiyasu Kaneko of Japan. 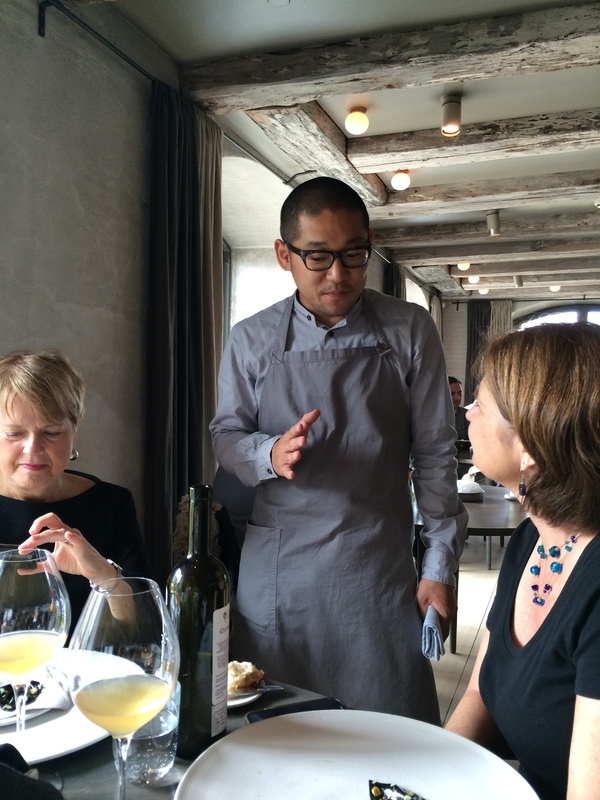 Noma Sommelier, Yukiyasu Kaneko of Japan. He answered our questions (I had a longer chat with him later) and explained his theory of using younger wines to compliment Noma’s unique cuisine. 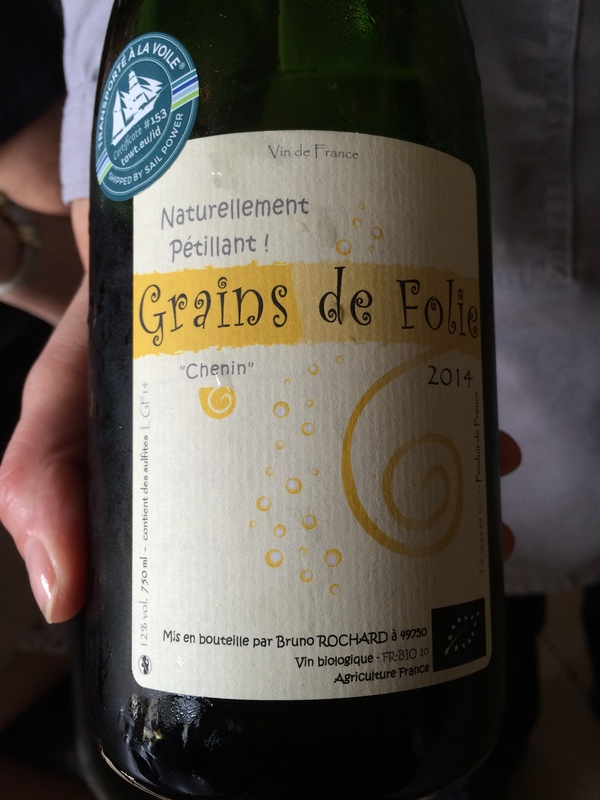 2014 Grains de Folie, Bruno Rochard, Coteaux du Layon – Loire. 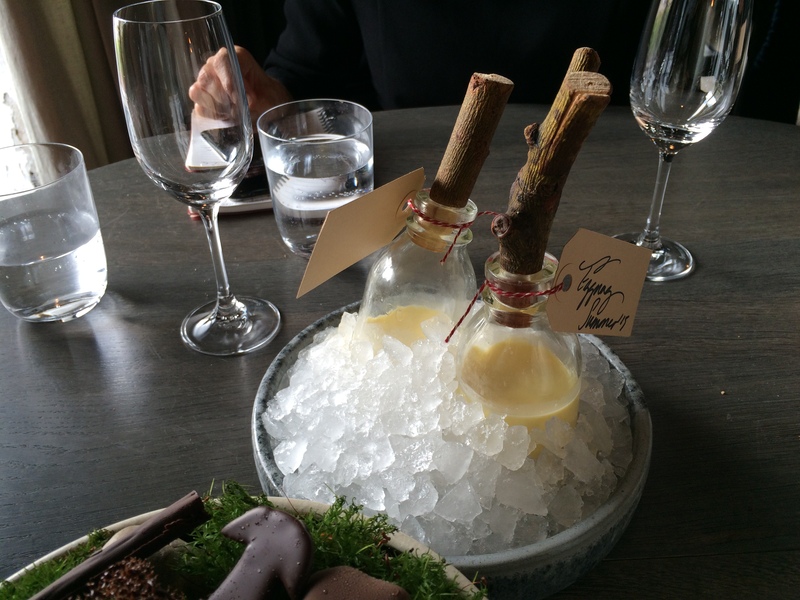 The Cheese Course – Not Sure of the Ingredients beyond a Creamy Cow’s Cheese. The next wine, a 2014 Grains de Folie, Bruno Rochard, Coteaux du Layon – Loire Valley, Chenin Blanc (LINK – Related) comes from a region known for sweet wines. This wine, was a bit on the sweet side of dry. It was light, refreshing, and a nice pairing for the cheese course (also not on the written menu). The pairing worked well. The cheese was light and creamy, in a vegetable broth. Very good. Berries and Greens Soaked in Vinegar for One Year. 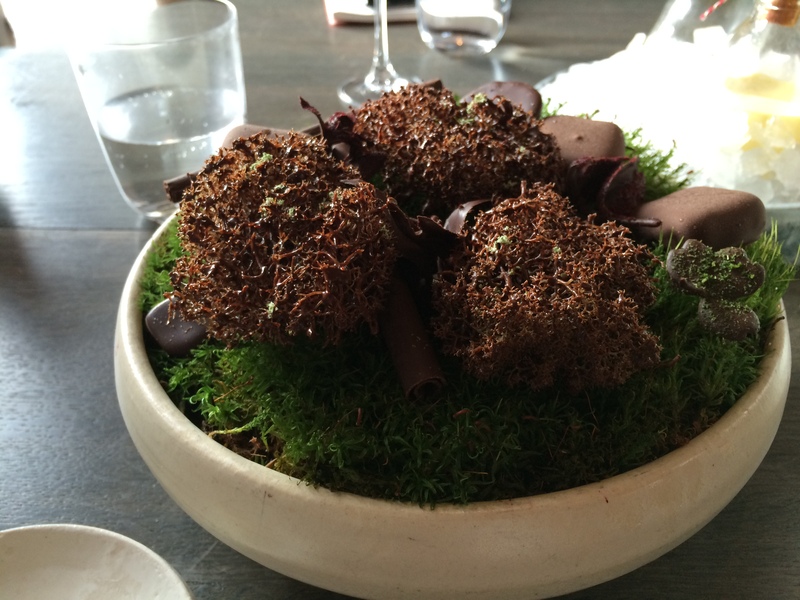 Forest Flavors – Deep Fried Reindeer Moss Dipped in Chocolate. Desserts were a flurry of items, pickled and sweet, with egg liqueur and espresso. 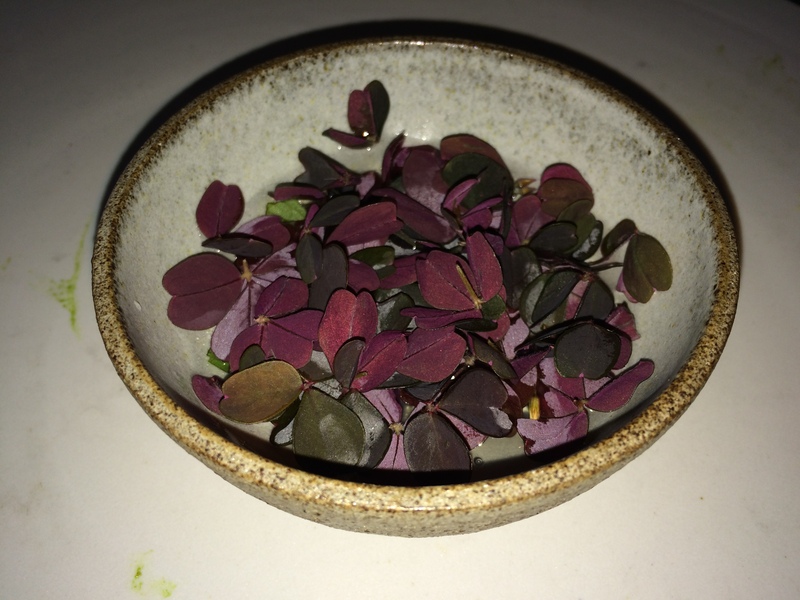 The berries and greens soaked in vinegar for one year were very good – each retained much of its original flavor, but the textures were very unusual. The forest greens dipped in chocolate were a combination of tart, sour and sweet – the creme dipping sauce could tip it to the sweet side if you preferred, plus there were some more conventional chocolates on the plate. The egg liqueur was very smooth, much thinner than eggnog, and refreshing. I should point out that Dorianne has allergies to beef and cow dairy, and the Noma staff made every effort to accommodate her in this regard, substituting ingredients, etc. You let them know 30 days in advance of your reservation about any allergies. Wow. What a meal! The 18 courses turned out to be 20. We were well-fed, entertained, amazed, and, actually, ready for more. In the next and final installment of this series, I will let you know about the tour that you are offered of the Noma Complex and what you learn about the unique Noma Culture.